I know what you're thinking: "there's only a couple weeks left in 2007, surely Shane is done with the Halifax-centric reviews for this year." Sorry friend, but I have one left in the tank. 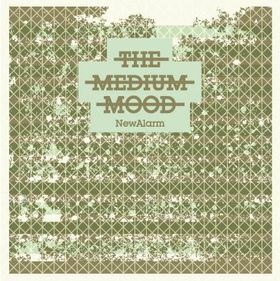 It comes in the form of The Medium Mood's debut full-length album, New Alarm. Granted, The Medium Mood is based in and around the Truro, Nova Scotia area, but I believe one or more of the band members have lived in Halifax in the past. Not sure how many of our readers are familiar with Truro, which is a town about an hour away from Halifax, but the Medium Mood's brand of jarring, At The Drive In/Pixies influenced post-punk is not what I expected to be coming out of Truro. For starters, I don't hear nary a jug nor a washboard being used at any point throughout the album. I know that sounds like typical city-guy assholery, but my maternal grandparents lived in Stewiacke, a tiny town about 10-15 minutes from Truro which makes Truro itself seem like Paris. So I feel qualified to make that observation. In reality, I kid. I just wanted to make a jug and washboard reference. Truro's a fine town which boasts my parents' favorite Fish & Chips spot and its high school football team is usually excellent. It also now boasts a fine indie rock band in The Medium Mood, which consists of Chad Peck on guitar, Andrew Gordon on bass, and Adam Hartling on drums. Peck and Gordon also share the vocal duties. The trio was formerly known as Safety Scissors until some electro-indie character with the same name threatened them with sueage, and The Medium Mood was born. I'm not sure if that name was intended to be ironic, but there isn't much medium about the mood created on New Alarm (yikes that was pun-tastic). Despite being only three people, they manage to create the heavy, concussive sound of a much larger outfit. The satisfying crunch of Peck's guitar work often seems to be the showcase of their songs, but the bass & drums play a major role in propelling the songs along. The duelling vocals of Peck and Gordon (alternating between singing/yelling/screaming or sometimes all of that at once) also contribute to the largeness of the band's sound. The Medium Mood is clearly fond of the soft-loud-soft song dynamic, and it's used to full effect on the powerful opening trifecta of Big Bang Theory, Inventor, and There's Nothing To See Here. The fantastic drumming of All The Names makes it not only a change of pace, but an album standout as well. Martha Kelly (of Halifax's Murder She Wrote) adds her trombone to the cacophony of Warning and it adds a subtle wrinkle that also makes this song a standout. The slow burning Focus On The Trajectory uses the line "Debutantes and Squires, I've seen this before, so let's get it on", which is an enjoyable line, before it closes with an frenetic and enjoyable climax. Clearly an enjoyable song. Aleatoric and The Isonomy earn bonus points for prompting me to reach for the dictionary on back to back songs ("characterized by chance or indeterminate elements" and "Equal law or right; equal distribution of rights and privileges" respectively if you're interested). I like a band that pays attention to detail, and The Medium Mood's well-written, five page bio which accompanied their album as well as their album release show at the Marquee which they configured to be in surround sound suggest this is a band which is concerned with details. I also like any band that reminds me of Wintersleep, who released one of my favorite albums this year, and this album reminds me a lot of some of Wintersleep's earlier work. I read an interview with Wintersleep recently where they said Tony Doogan (who produced their latest album) mentioned something about them "hiding their hooks", and I think at times The Medium Mood could perhaps peel back some of their layers and give the melodic aspect of their songs a chance to shine. That being said, these guys are very proficient players and that has resulted in a very satisfying album. I found myself head-nodding my way through most songs and that's never a bad sign. This is a band I'll be keeping my eye on, you should do the same.